I purchased ten chicks from the local farm supply on March 10. There were various stages of days old, as the farm store got birds Monday, Wednesday and Friday. It appears that I got some from each day. Here is what I got this year, and my impressions of the birds. Speckled Sussex at 9 months. Purchased two These are supposed to be friendly and they have seem to be so without much effort on my part. They are some of the best most determined foragers I have ever had. 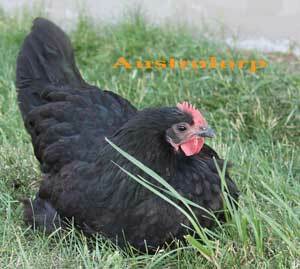 They also always seem ready to lay if they are not molting. They definitely were early layers. My husband thinks they flighty and just plain “spastic.” Verdict: They have been a better layer than lots of others in Montana, but smaller butchered than we generally want. Size: These are smaller than I have had in the past when a bird is dual purpose. Molt: fall 2012 both, October 2013 – both molt again. 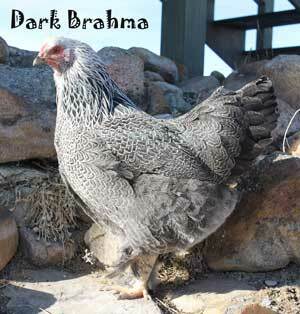 Dark Brahma It appears that the sexing on these were good and I have two pullets. I have never had this color in this breed before. I think that these are beautiful birds based on pictures I have seen. They have turned out to be innately friendly and are not disappointing me in their feathering . 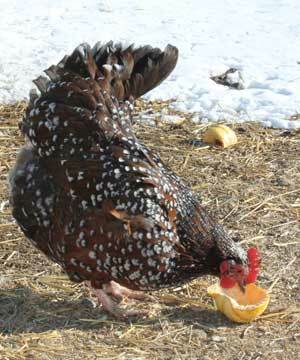 Eggs: average size, not a great layer, but no Brahma is when you compare it to a BR. Buff Brahma: two At ten weeks, I rehomed these via a Craigslist ad because they were bantam. They were purchased as standard size, straight run. I ended up with a hen and rooster. The Roo was a handsome devil. Dominque I am still learning about this breed. My Dom will not be a good judge of the breed, she is suffering a good case of scoliosis and is not developing very well. She was a great and early layer in spite of this. She dressed out nicely in spite of her strange body shape due to her spine. 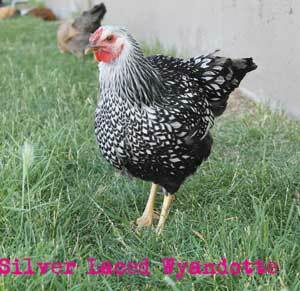 Silverlaced Wyandotte, When these were not broody or molting they were always interested in laying. Verdict: They were good layers and am trying them again.